AQAP, al Qaeda's affiliate in Yemen, on Thursday released a tenth issue of its glossy online English language magazine Inspire. Dated "Spring 2013" and compiled after French forces moved against jihadists in Mali in January, the magazine contains a familiar litany of propaganda articles railing against the West (with "crusader" France the latest target) mixed with how-to advice on launching terrorist attacks in the West, all illustrated with colorful graphics and catchy titles. But the new issue also cleared up a mystery that has long puzzled counterterrorism analysts. 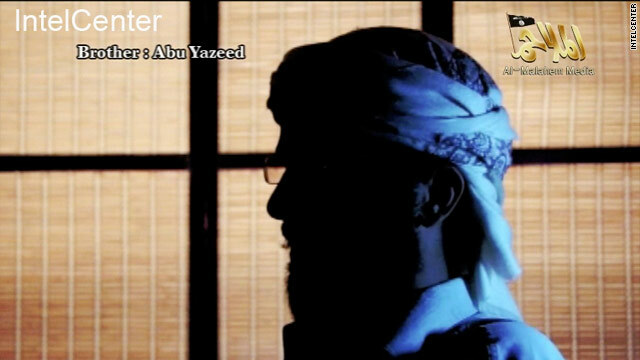 In late 2011, several weeks after a U.S. drone strike killed the magazine's original creative forces - American militants Anwar al-Awlaki and Samir Khan - a new English speaker called Abu Yazeed began to appear in AQAP's videos. His face was partly in shadow, but one could make out glasses and a full beard. He spoke with an accent. At the time, counterterrorism analysts had no idea who he was. 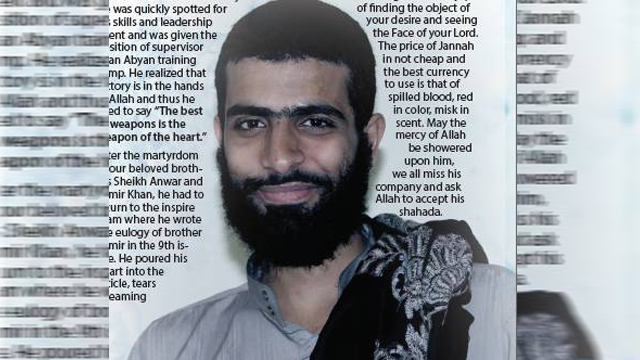 But the latest issue of Inspire lifted the veil in an obituary piece revealing that Abu Yazeed had been killed while fighting in southern Yemen. It described Abu Yazeed al Qatari as a Yemeni in his early 20s from "a respectable family" who spent much of his life in Qatar. 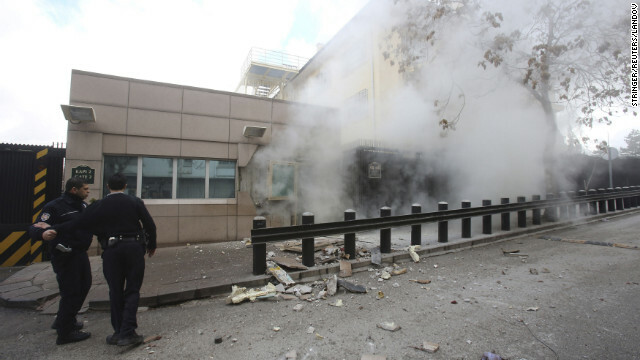 Turkish police officers react after an explosion at the entrance of the U.S. Embassy in Ankara Friday, February 1, in this picture provided by Milliyet Daily Newspaper. In Ankara, Turkey, U.S. Secretary of State John Kerry came face to face with a tragedy that scarred his first day in office: the death of a security guard at the U.S. Embassy in the capital city. Mustafa Akarsu died in a suicide bombing at the gates to the embassy he had guarded for 20 years. On Friday, his wife, two children and their uncle sat in the sunshine on the lawn of the embassy as Kerry expressed condolences on behalf of President Barack Obama and the American people. "That was my first day as secretary of state," he said. "When I raised my hand to take the oath of office, this tragedy was immediately on my mind and in my heart, and I have carried the memory of that courage in every embassy I have walked into since, and I will in the days ahead." Kerry presented to the family the American flag that flew over the embassy the day Akarsu died. When the terrorist came to the gate, he said, "Mustafa didn't hesitate for a moment. He and his fellow guards acted heroically, saving lives, with quickness and with bravery." 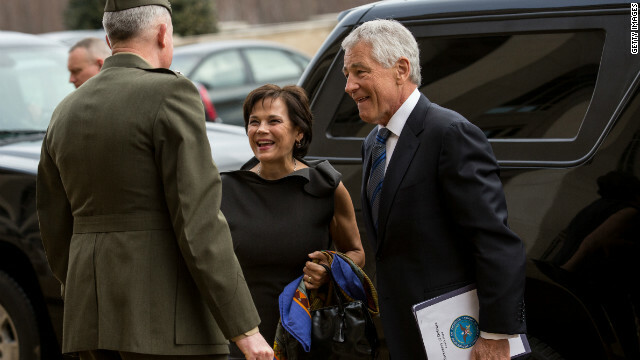 The Joint Chiefs of Staff plan to brief newly minted Defense Secretary Chuck Hagel on the impact that spending cuts - slated to go into effect Friday night - might have on military readiness. Defense programs would bear half of the $85 billion in government-wide spending cuts that are to go into effect absent congressional action. Hagel's first session with leaders of the service branches since his swearing-in is to occur Friday afternoon in "the tank," a secure Pentagon meeting room. The Joint Chiefs will brief Hagel on what the planned cuts involve and how they might affect readiness, a senior Pentagon official said.